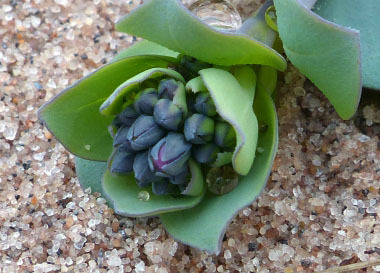 This pleasant tasting plant is in the Boraginaceae family and is primarily found along sandy coastal habitats, such as the upper reaches of beaches, and sand spits. Sea lungwort is a perennial plant with taproots that seems to do well in dynamic, high-stress habitats with shifting substrates. 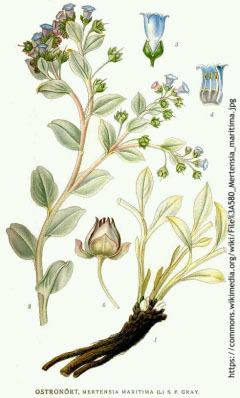 The Latin name, Mertensia, is taken from the name of a German botanist, F. C. Mertens (1764 to 1831). Also known as oysterleaf, this plant is considered endangered in some areas so please check with local conservation authorities before gathering. Distinguishing Features: A very distinctive species, sea lungwort is a fleshy, low growing, sprawling plant that typically has blue-green ovate leaves that form on flowering stems. 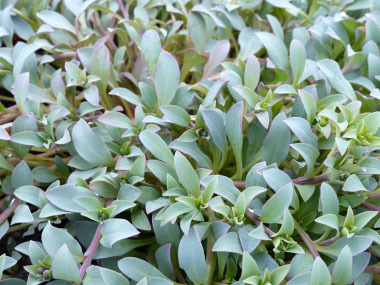 Stems are close to the ground as this is a low, trailing plant. Attractive bluebell-like flowers add colour to the landscape when in bloom. Its short stem radiates out in different directions from a single point, carpeting the ground. Flowers: From spring to early summer this plant bears small bluebell-like flowers in the leaf axils. The flowers produce 5 fused petals, are purple or blue, and rarely are white. It has yellow anthers, 5 stamens whose filaments are glabrous and fused to the corolla. Seeds measure 3 to 4 mm long, are yellowish and have a smooth surface. Seeds ripen from July to September. 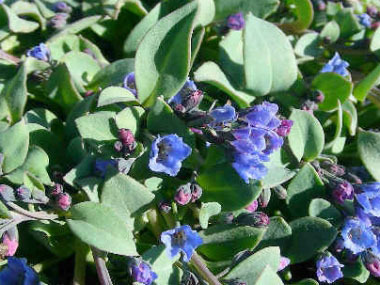 Fields of Nutrition has medicinal benefits and vitamin/mineral content of Sea Lungwort. 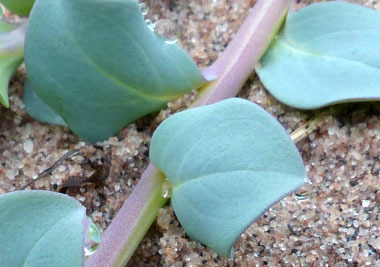 Leaves: Blue-green ovate leaves distributed along the stems grow alternately. Petioles may be present near the inflorescence. They measure up to 40 mm long; are winged, flat, and glabrous. Leaf blade bases are attenuate (thin), generally measure 15 to 35 mm long, and 4 to 12 mm wide. Margins are smooth. Leaf colour is typically blue-green or greyish-blue tinged, some with purplish-red margins. 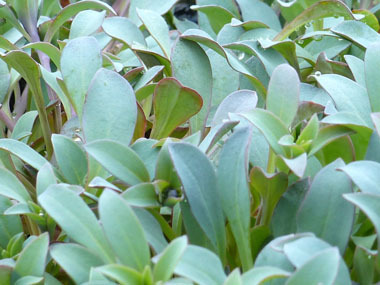 Height: Ground level or underground stems grow vertical. Sea lungwort grows anywhere from 3 to 30 cm (1 – 11”) high, although the height is formed when many stems grow over one another forming dense mats. 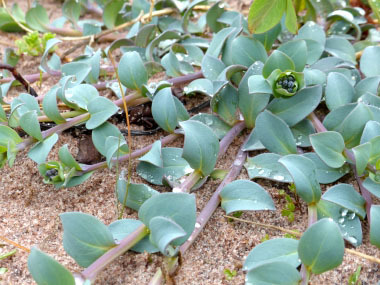 Habitat: Sea lungwort can be cultivated but in the wild it is found usually along seashores; but can also be found in sandy areas located a bit further away from the water. It can grow at elevations from sea level to 10 metres (30'). Substrates include seashores; dry, gravel (beaches), and sand in which there is low organic content. Sea lungwort is located moreso in the northern latitudes of the northern hemisphere. 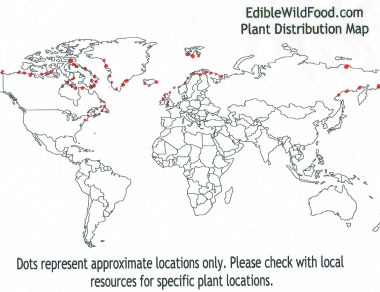 Edible parts: The leaves can be consumed raw or cooked and have a somewhat mild, yet pleasant taste. The thick leaf has a mucilaginous texture. Leaves can be added to salads, and they go quite well with eggs. Flowers are edible and the taproots were once eaten by Inuit.